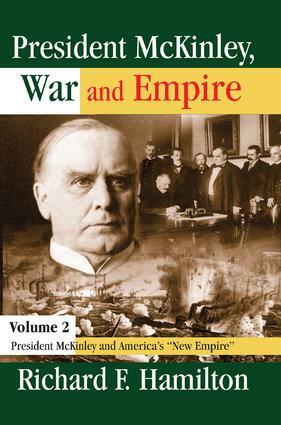 This second volume of President McKinley, War and Empire assesses five theories that have dominated analysis of modern societies in the last century--liberalism, Marxism, mass society, pluralism, and elitism--in accounting for an aberrant event in American history: the Spanish-American War. President McKinley and the Coming of the War 1898, volume 1 of this definitive history, considered the origins of that war. This second volume is concerned with the war's outcome; the settlement in which the U.S. gained an "empire." The book begins by reviewing various expansionist episodes in U.S. history--some successes, some failures--and by analyzing the complexities, support, and opposition involved in expansionism. It then examines the work of expansionist writers, men said to have "driven" the 1898-99 movement, finding these claims to be questionable. Hamilton assesses McKinley's decision-making in regard to the settlement of the Spanish-American War, including the influences that might have moved him, as well as his own justifications. He then reviews the subsequent achievements: the size and character of the new American "empire;" trade flows the Philippine experience and U.S. efforts in China--supposedly the prime goal of the new imperialism. Many contemporary writers anticipated great possibilities in China, but that "fabled" market remained minuscule throughout the following century. Much American trade continued to be with Western Europe, while the biggest change in U.S. exports went largely unnoticed--Canada became the nation's number one trading partner. In much historical writing, McKinley is portrayed as little more than a "front man" for Mark Hanna, the adept businessman-politician who organized and led his presidential campaign, aided by generous financial contributions from business leaders across the nation. Hanna certainly was a leading figure in McKinley's career, but the assumption that his influence was controlling is not justified, as has been shown in recent research. McKinley was far more than a figurehead easily manipulated by representatives of "the interests."